BOSTON, MA--(Marketwire - September 21, 2010) - DataXu (www.dataxu.com), the leading media management platform for digital advertisers, today announced the availability of DX2, the next generation of its industry leading Demand-Side Platform. DX2 measures, buys, and optimizes ad placements across online, video and mobile display channels, on a real time, impression-by-impression basis. The platform currently makes over one million media decisions a second, delivering a deeper level of consumer insights and media control. DX2 redefines the DSP market, giving brands the power they need to manage all their media investments and more effectively engage consumers. It delivers the superior performance of exchange buying, combined with essential brand controls. Dynamic ad decisioning intelligence self-tunes to continually optimize campaign performance across over 100 consumer, creative and context parameters. "The last several years have seen an explosion in online advertising inventory and audience fragmentation. With more sites, ad networks, and exchanges selling more inventory than ever, advertisers need an automated approach for reaching and understanding digital consumers," said Adam Cahill, EVP, Co-Media Director at Hill Holliday. "DX2 cuts across the silos to efficiently deliver the best possible performance for truly integrated campaigns and empowers advertisers to keep pace with their consumers." Multichannel campaign management -- Access to over 100 billion auction media impressions across online display, mobile and video channels. In addition to current supply partners, the platform is integrated with Nexage (www.nexage.com) and Mobclix (www.mobclix.com) for mobile inventory and adap.tv (www.adap.tv) and BrightRoll (www.BrightRoll.com) for video inventory. Mobile and video beta programs will run through Q4, 2010. Brand Power -- Choose from four levels of brand safety using semantic analysis at the page level, set global reach and frequency controls, measure campaign impact on upper funnel metrics including awareness, favorability and purchase intent, and deploy rich media assets across the exchanges. Workflow Management & Reporting -- Manage and optimize campaigns through a powerful easy to use self-service interface and reporting dashboard. Scalable Precision Targeting -- Specify content at the page level and target consumers at the individual user level, including age, gender and location -- across the entire Internet. Advanced Analytics -- Understand your customers and how best to engage them. "Team Detroit is at the forefront of digital display advertising, embracing the change required to market to the new breed of consumer who moves quickly across different channels and devices," stated John Gray, SVP Director of Interactive Media, Team Detroit. "We are impressed with the speed of innovation coming from DataXu, they were a natural choice as a partner clearly driving a transformative change in the industry." "Our agency and brand partners are experiencing significant performance improvements and gaining valuable insights on the pulse of the connected consumer," stated Mike Baker, President and CEO, DataXu. "With their input, we have taken DX2 to the next level, distancing DataXu from the first wave of DSP market entrants and paving the way for the future direction of all digital advertising." 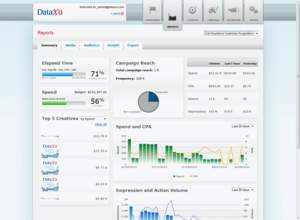 DataXu, headquartered in Boston, Massachusetts, provides the leading real-time media management platform for online display advertisers. This powerful technology increases digital campaign performance, improves operational efficiencies and delivers unique consumer insights to advertisers. DataXu's executive team unites leading executives in digital media with MIT technologists. The private company is backed by Atlas Venture, Flybridge Capital Partners and Menlo Ventures. For more information, visit www.dataxu.com or follow us on Twitter at @dataxuinc. Campaigns are so easy with DataXu!